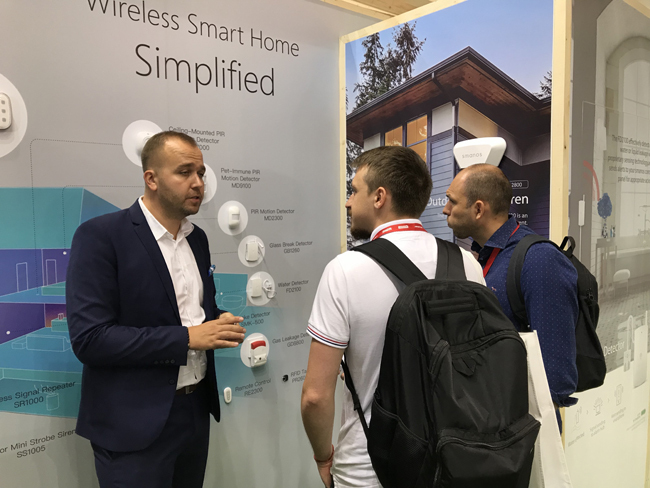 Berlin – Sept 1, 2017 – smanos, a trendsetting innovator and dynamic developer of wireless smart home and DIY security systems, is excited to be back at?IFA in?Berlin again from?Sept 1 to 6,?and is proudly presenting its smart home solution portfolio, with live presentations. From WiFi, cellular, app-enabled alarm and video systems to remote security and energy management, smanos solutions cater to today’s mobile-driven lifestyles and ever-evolving residential needs, and ensure property owners and their family members have complete control, comfort and visual confirmation right at their fingertips within a few short minutes and easy swipes and taps. The complete smanos smart home portfolio speaks minimalistic elegance, self-installation and self-monitoring, and is available at?Booth 122 in Smart Home Hall 6.2 at Messe Berlin throughout the 6 days. The K1, the ultimate home automation and security center, is smanos’s smart home gateway, combining butler- and guard-like functions into a stack of esthetically pleasing round discs. Up to 50 wirelessly connected devices, including sensors and cameras, can be intuitively operated as part of the system, either locally on-site or via an iOS or Android mobile device. “We have added a few cool features to the K1 smart home hub so that it is Z-Wave compatible and works with the Nest? thermostat and Amazon? Echo,” said Joe Xiang, Business Development Director. “With smanos’s intuitive operation and user-adjustable scalability, your smart and connected home has just become that much more adorable and affordable with the K1.” The newly enhanced Red Dot Product Design and Computex d&i Gold Award winner K1 kit is available worldwide at an MSRP of €269.99* (WiFi version). Available separately or as part of the K1 system, smanos’s UFO Panoramic WiFi HD Camera brings clarity, immersive vision and ease of use to home monitoring, through its surveillance-grade HD fisheye lens, superior night vision and accurate motion detection technology. The smanos UFO camera can be mounted on the ceiling or any flat surface, and provides six selectable viewing angles for all possible monitoring needs, directly on your iOS or Android smartphone. The footage is stored on-site (via an optional microSD? memory card) for free, and soon can be accessed, shared and archived remotely via the cloud for a fee. The smanos UFO Panoramic WiFi HD Camera is globally available, at an MSRP of €179.99. As a proud winner of Computex d&i, TWICE VIP, DISTREE Diamond and National Hardware Show Silver Awards, smanos’s new Smart Video Doorbell empowers you to answer the door even when you’re not home! The doorbell captures and sends real-time video and audio to the homeowner’s and their family members’ smartphones. With the free iOS or Android app, users can speak with the visitor – or potential intruder – from anywhere in the world as long as their mobile device is online. The doorbell features simple DIY installation, is AC-powered (with backup batteries for usage around 10 hours), and works independently or in tandem with the smanos K1 to connect to other wireless sensors as your dwelling’s requirements continue to evolve. The smanos Smart Video Doorbell will be available globally in Q4 2017, at an MSRP of €199.99. Expect to find more on display at IFA Berlin 2017, and do watch this space for updates on more profit-generating and user-friendly smart home sensations from smanos. Designed in the Netherlands and marketed worldwide, smanos is our complete security, monitoring and automation system lineup for today’s homeowners, said Hayden Hsu, Senior VP. “What makes smanos a must-have brand to distributors, retailers and operators is that we’re truly committed to researching, designing anddelivering innovative, comprehensive and easy-to-use smart home solutions that will help them outperform their sales and profit targets.” Worldwide, what’s being demanded in the residential market these days is smart, simple, sleek, mobile yet compact and integrated ingenuity, and smanos will continue providing just that, with even more home automation, cloud-based management and monitoring options. In the picturesque outskirts of Amsterdam (Hoofddorp) came about the inception of smart home technology brand smanos in 2013. Harnessing cutting-edge design concepts, smanos delivers the ultimate user experience of wireless smart home and DIY security systems to households worldwide. Promising more than just a sense of security, smanos also ensures user-definable comfort and convenience, along with mobile accessibility and confirmation. In its pursuit for perfection in human-centric research and design, smanos continues to wow homeowners by putting the smarts of smart home and smart security directly in their hands.Dream big and live smart with smanos now!